Avoid Surprises and Drive Away Happy! Get the Proof Today! About Us | Contact Us | New Vehicles | Used Vehicles | Vehicle Leasing | Credit Application – APPLY NOW! Save time, save money, and let us help find the perfect vehicle for you! Each of our quality used Sedans, SUVs, Compacts, Trucks, Mini Vans and Commercial Vans include their respective vehicle history report, which provides detailed insights to any vehicle accident history, vehicle liens, unfixed safety recalls – courtesy of our CARPROOF Vehicle History Reports! CARPROOF is Canada’s definitive source of automotive information, delivering vehicle history, appraisal and valuation. Drawing on millions of data records from thousands of unique sources, its products enable used vehicle buyers and sellers to make informed decisions. CARPROOF is trusted to provide impartial and comprehensive information to dealerships, vehicle manufacturers, consumers, major auctions, governments, insurance providers, police and various government agencies. Dedicated to transparency since its founding in 2000, the company has been named one of Canada’s 50 Best Managed Companies, and was also honoured with Deloitte’s Technology Fast 50™ and Fast 500™ awards. To date, over 13 million vehicles have been issued with Car Proof Vehicle History Reports across North America. Previous damage can impact the value and safety of a vehicle, especially if it hasn’t been repaired properly. Car Proof can detail any damage (from a hail storm to a total loss) providing third-party validation of the vehicle’s history. A lien is basically a loan, and if a vehicle has a lien on it, the new owner may find themselves responsible for the previous owner’s debt. Our Car Proof vehicle history report will ensure there are no registered liens before you purchase your next vehicle. An estimated 1 in 5 Canadian vehicles have an unfixed safety recall, meaning they’ve been deemed unsafe to drive by their own manufacturer. 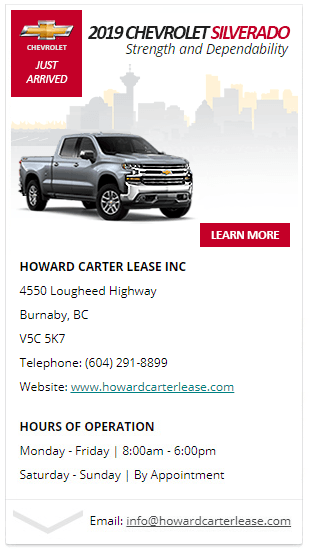 At Howard Cater Lease in Burnaby – we provide further ‘peace of mind’ with the safety assurance for each of our quality vehicles! At Howard Cater Lease, we’ve been exceeding our loyal customer’s expectations for over 54 years. Today, we remain committed to providing an unrivaled vehicle purchasing experience – that removes any pressure and provides our customers with the unparalleled level of service, superior vehicle selection and the affordability they desire.